Flushing-Main Street bound 7 train @ Queensboro Plaza. Resized photo courtesy of Eye On Transit. This year, 4,113 7 Flushing Line riders graded the service they receive – 3,913 by mail and another 200 via the Internet – compared to the 15,800 responses received in 2007. Riders gave “Cleanliness of stations,” “Cleanliness of subway cars” and “Lack of scratchitti in subway cars” a “C” grade, up from “C-minus” in 2007. “Station announcements that are easy to hear” and “Station announcements that are informative” received “C-minus” grades, up from “D-plus” grades in 2007. However, riders gave “Minimal delays during trips” a “D-plus,” down from “C-minus” in 2007. Also, “Reasonable wait times for trains” dropped to a “C-minus” from “C” last year, while “Adequate room on board at rush hour” was graded “D”, the same as it was in 2007. Overall, riders who took part in this year’s survey gave the 7 a “C-minus,” the same grade the line received in 2007. 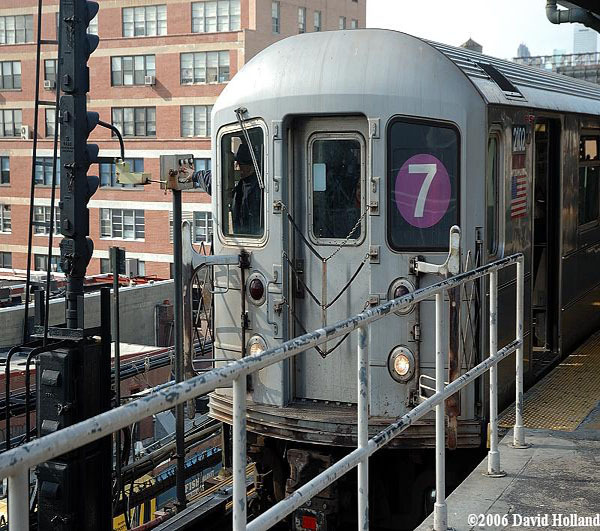 Riders on the 7 Line were also asked to prioritize the improvements they would like to see. As they did in 2007, riders listed the same three preferences but in a slightly different order. This year, those priorities are “Minimal delays during trips,” “Adequate room on board at rush hour” and “Reasonable wait times for trains,” a swap in the order of the top two priorities from 2007. Unlike with the , the overall grade for the matches what the data grades out at. The MTA, more specifically New York City Transit must be very disappointed with the results for the . They added extra service & implemented the line manager program yet the riders feel everything remained status quo. Lets first look at the overall priorities which featured the same top 3 from last year albeit with the top 2 switching places. Either way it is not a good sign when you implemented what you felt were positive responses to the riders desires yet the top priorities remained the same. The real alarming part of all of this is the drop in grades for the top 2 priorities. The top priority as you can see was a “minimal delay in trips” & the grade went from a C- last year to a D+ this year. The second highest priority “Adequate room on board at rush hour” remained at a D. The third highest priority “Reasonable wait time for trains” went from a C in 2007 to a C- this year. This is a very disturbing trend for a line that actually received some changes. As far as the rest of the top 10 goes, the news continues to be negative. It is not a good sign when elevator & escalator status jumps up 2 spots in the priority list. This is a sign of more malfunctioning of equipment that riders depend on daily. Security inside the train cars is also another area which riders feel needs a huge improvement as it also rose 2 spots from last year. Security on station platforms jumping into the top 10 is not a good sign either. As I mentioned in my analysis of the L’s results, maybe more cops need to venture onto the line to keep an eye on things. At least the cleaning efforts have improved as that priority fell 2 places. However they can’t be satisfied with that & I hope they keep improving in the cleanliness department. In terms of overall grades for each category, the poor performance of the top 3 priorities overshadows everything else. Of the 21 categories, only 6 showed an improvement & none were that spectacular. This is unacceptable considering the attention payed to the & after last year’s initial results for the respective lines. With the dire financial status of the MTA, who knows how they can really turn this around but riders clearly feel it must be.